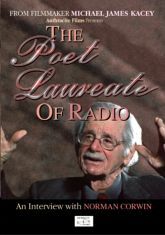 Known as the Poet Laureate of Radio, Norman Corwin is perhaps the greatest writer-producer-director the Golden Age of Radio ever produced. His plays could be whimsical, musical, poetic, horrific, teeth-rattling, and stomach sinking. He was, quite simply, the master of the art form. His CBS radio series included "Norman Corwin's Words Without Music," "Twenty-Six by Corwin," "Columbia Presents Corwin" and "One World Flight." Mr. Corwin is responsible for perhaps the single greatest radio broadcast ever, V-E Day's "On a Note of Triumph." Mr. Corwin captivates from first to last frame. His insights and memories range from his earliest recollections of radio to topics such as fascism, the obligation of an artist, and the art of directing.